I like quinoa, in general, but when quinoa is cooked in my donabe, it becomes something so special and almost dangerously good (because I can't stop eating!). The double-lid donabe rice cooker, "Kamado-san" doesn't only make premium-quality rice, but it also does amazing job cooking different kinds of grain. Here's a very quick and easy quinoa recipe with Kamado-san. This time, I used my baby-size Kamado-san (1 rice-cup size) for a small amount. 1. Rinse 1 cup (240 ml) quinoa (I used mixed colors). 2. In Kamado-san, heat 1 tablespoon olive oil and saute the quinoa for a couple of minutes over medium-heat. 3. Add 1 cup (240 ml) vegetable stock and 1/2 cup tomato sauce. Season with a little amount of salt and pepper. Stir. Add a bay leaf in the center. 4. Cover with both lids and cook over medium-heat for 12 minutes. Turn off the heat and let it rest (covered) for 15-20 minutes. It tastes great on its own or you can serve it as a side dish for your protein. 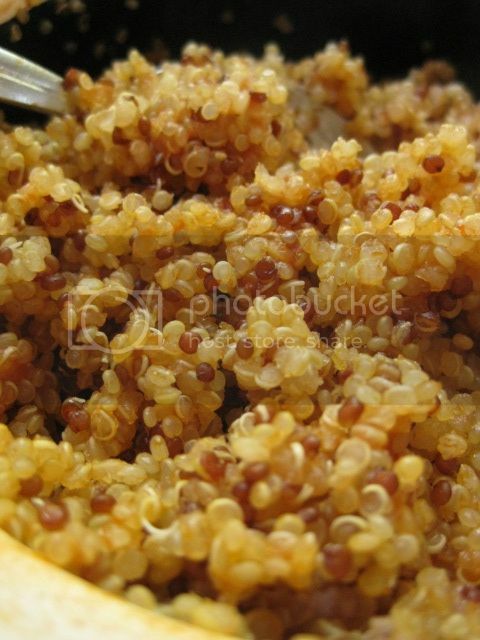 The texture of donabe-cooked quinoa is really great, as I can really taste each grain.